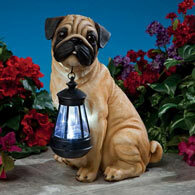 Our solar powered lanterns are the perfect welcome for visitors and friends to your home. A unique and clever accent for your patio, garden or porch. 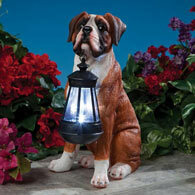 Each hand painted resin dog sculpture holds a hanging solar powered lantern that soaks up the sun's energy by day and automatically turns on at dusk. Includes on/off switch. 1 rechargeable, NiMH AA battery, included. It measures 10-1/2" x 4-3/4" x 6".